When a volcano’s eruption sends the people of a remote village fleeing into the tunnels under the mountain, the player characters must struggle to survive against myriad threats, such as foul monsters, starvation, and perils posed by a deadly environment. 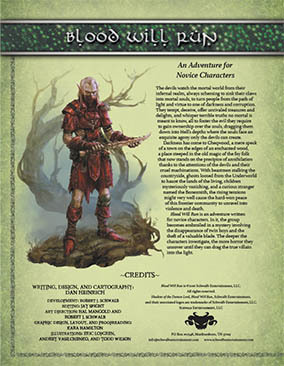 A guided adventure, this scenario features audio tracks to make it a breeze to prepare and run the adventure. 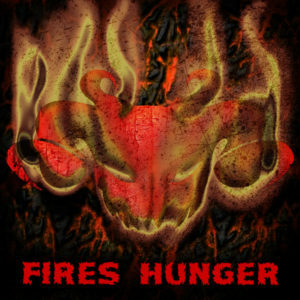 Salamanders, a deranged brood mother, and an fearsome temple await the player characters in Fires Hunger! Grab your copy from Schwalb Entertainment or DriveThruRPG today! Life on the edges of the Empire offers none of the protections enjoyed by people who live within the bounds of civilization. The roads in this wilderness wind through a countryside overrun with terrible monsters, foul beastmen, and other horrors. Any stand of trees might shelter a band of brigands. The burned-out hulks of farmhouses and abandoned carriages offer testimony to what happens to those who fail to take sufficient precautions when they cross the gloomy countryside. People living on the frontier survive by using whatever is available to them. For some, this means relying on a trusted witch or a few stalwarts with keen eyes and sharp swords. Others might depend on something more sinister to protect themselves. 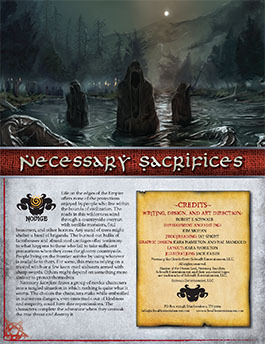 Necessary Sacrifices draws a group of novice characters into a tangled situation in which nothing is quite what it seems. The choices the characters make while embroiled in numerous dangers, even ones made out of kindness and empathy, could have dire repercussions. The characters complete the adventure when they unmask the true threat and destroy it. In the beginning, there was Death in Freeport, the award-winning adventure that revealed the City of Adventure to thousands of tabletop gamers. 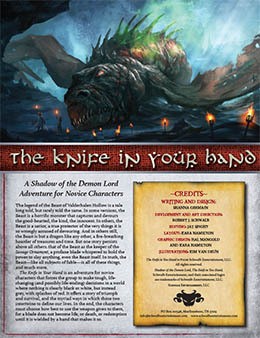 Originally designed for Dungeons & Dragons, this adventure has been updated and adapted for use with the Shadow of the Demon Lord tabletop roleplaying game. This adaptation brings Freeport to the world of Urth and shows you how the exciting tales and thrilling adventures set in this evocative city began. Designed for novice characters, the characters find themselves stranded in Freeport, the great trading city on the Pirate Isles, and are recruited to perform a simple job for a decent reward. However, the deeper they dig into the mystery, the stranger the tale becomes until they uncover a terrible conspiracy and secrets worth dying for. Death in Freeport is the first part of the epic Freeport Trilogy. 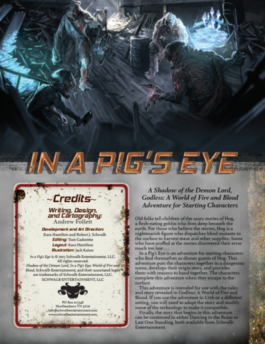 To use this adventure, you need a copy of Shadow of the Demon Lord. 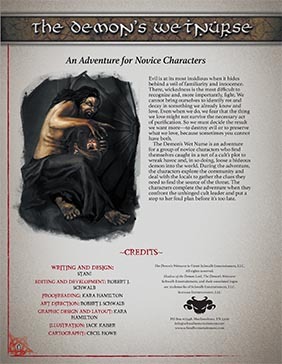 While not expressly necessary, having the Shadow of the Demon Lord Freeport Companion (coming soon! 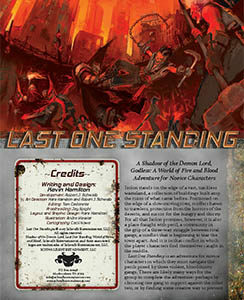 ), and the Demon Lord’s Companion. Green Ronin Publishing’ The Pirate’s Guide to Freeport will certainly enhance your experience. 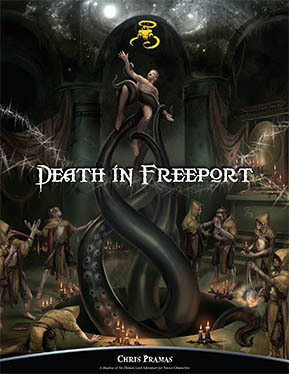 Buy Death in Freeport as a PDF from Schwalb Entertainment or DriveThruRPG! 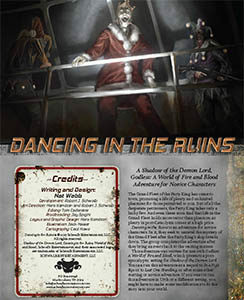 Buy the PDF today from Schwalb Entertainment or DriveThruRPG! The devils watch the mortal world from their infernal realm, always scheming to sink their claws into mortal souls, to turn people from the path of light and virtue to one of darkness and corruption. They tempt, deceive, offer unrivaled treasures and delights, and whisper terrible truths no mortal is meant to know, all to foster the evil they require to gain ownership over the souls, dragging them down into Hell’s depths where the souls face an exquisite agony only the devils can create. Darkness has come to Cheqwood, a mere speck of a town on the edges of an enchanted wood, a place steeped in the old magic of the fey folk that now stands on the precipice of annihilation thanks to the attentions of the devils and their cruel machinations. 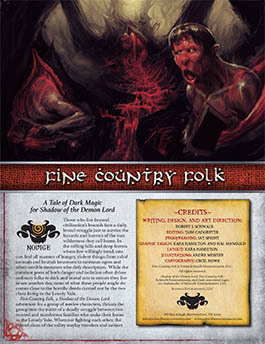 With beastmen stalking the countryside, ghosts loosed from the Underworld to haunt the lands of the living, children mysteriously vanishing, and a curious stranger named the Bonesmith, the rising tensions might very well cause the hard-won peace of this frontier community to unravel into violence and death. Blood Will Run is an adventure for novice characters. In it, the group becomes embroiled in a mystery involving the disappearance of twin boys and the theft of a valuable blade. The deeper the characters investigate, the more horror they uncover until they can drag the true villain into the light. Buy Blood Will Run as a PDF from Schwalb Entertainment or DriveThruRPG!